JESSE LIVERMORE earned his reputation as a talented speculator by pocketing a tidy sum during the Panic of 1907. Mindful that a scarcity of credit and a giddy stockmarket were a dangerous mix, he began to sell stocks short that autumn. When share prices crashed on October 24th, Livermore was up by $1m ($27m in today’s money). He then changed course. He started to buy stocks, which were now a lot cheaper. The market rallied. By the end of the year Livermore had made $3m. Anyone who has ever invested in stocks has at one time fancied that they can time the market as exquisitely as Livermore did. Very often, they hope that a benchmark of fair value, such as the cyclically-adjusted price-earnings ratio, or CAPE, will be their guide. History shows that when stock prices rise a lot faster than profits—as they did in the 1920s, 1960s and 1990s—they tend subsequently to fall back (see chart). So the market-timer will sell when the CAPE is high and buy them back when it is low. It seems simple. In practice, it is surprisingly hard to use valuation gauges to time the market. Investors who try often sell far too early. As a consequence, they miss out on some of the richest returns. Selling stocks when everyone is still buying may actually be the easy bit. 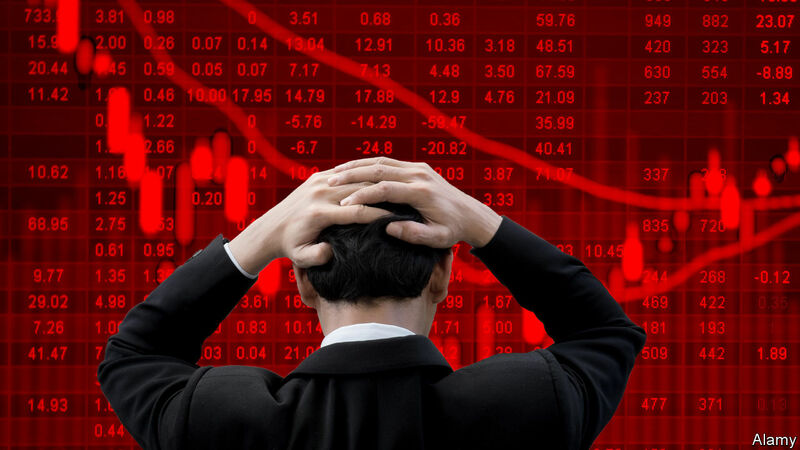 It is harder to find the nerve to buy stocks when others are selling them in a panic. The purist view is that market timing is a mug’s game. It says stocks are a random walk: their past indicates nothing about their future path. In the 1980s academics questioned this creed. Since stock prices tend to revert to a mean value, they must be somewhat predictable. They deviate from this fair value only because investors over-react to news. When profits are strong and stocks are rising, there will be keen buyers almost regardless of value. The reverse is true in recessions. This herding—or, if you prefer, this rational pricing of risk—creates the opportunity for market timing. There is a drawback. What is “cheap” or “dear” is defined by reference to the full history of prices. But an investor active in any period could not have known this in advance. Nor is it obvious at the time whether the CAPE is close to a peak or trough. Without the benefit of hindsight, timing produces disappointing results. A study in 2017 by Cliff Asness, Antti Ilmanen and Thomas Maloney of AQR Capital Management tested a timing strategy. Their gauge was a rolling 60-year average of the CAPE. 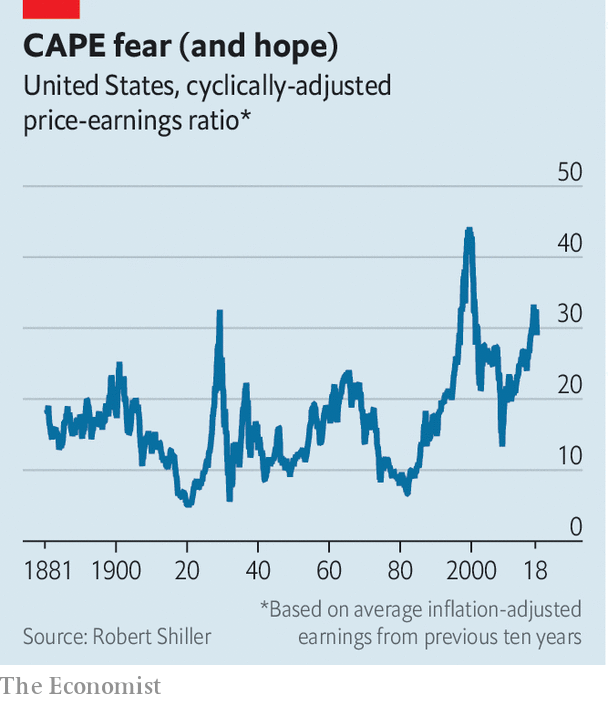 When the CAPE was below its historical median—that is, below fair value—the strategy would borrow to buy stocks. When it was above fair value, it would lighten up on stocks in favour of cash. Over the whole period (1900-2015), returns to the market-timing strategy were scarcely better than to a buy-and-hold portfolio with a constant 100% stockholding. And over the latter half (1958-2015), returns were no better at all. A big failing was that the strategy was under-invested in stocks for too much of the time. The average CAPE has trended upwards since the 1950s. Too often stocks were deemed dear based on historical valuations. Timing works no better in countries other than America. A study in 2013 by three academics, Elroy Dimson, Paul Marsh and Mike Staunton, found no consistent link between valuation and subsequent returns in 23 stockmarkets. Value is too weak a signal to be much use. But it can be improved upon. The AQR researchers found that combining the value benchmark with a “momentum” signal of the underlying trend in stock prices yields better results. This is intuitive. The problem with value benchmarks is that prices drift away from them for long periods. But a blend of value and momentum represents “value with a catalyst”, as the authors put it. This strategy is too complex for ordinary investors to profit reliably from it. But there is a simpler form of market timing, which has some empirical support: rebalancing. It requires investors to decide first how they want to divide their investments. It could be, say, an equal split between American and non-American stocks. The precise weights matter less than that they are stuck to. That requires regular rebalancing to restore the original weights. It means shedding assets that have risen a lot in favour of those that have gone up by less. The virtue of rebalancing is that it is simple. You are less likely to make a costly mistake than if you follow a more complex strategy. The drawback is that you must give up the delusion that you can time it like Livermore. To do what he did takes nerve and a rare feel for markets. You may think you have such talents. You almost certainly don’t. As the two try to deter each other, they may instead move closer to war. The threat of precision-guided missiles is raising the specter of yet another Lebanese-Israeli conflict. Hezbollah has had rockets and missiles for several years, but it now appears that Iran may be directly supplying the militia with precision-guided missiles or helping to manufacture them in Lebanon. Fars Air Qeshm, an Iranian civil aviation company with ties to the Islamic Revolutionary Guard Corps, has flown at least four unusual flights from Tehran to Beirut since July. Some have passed through Damascus, but all took circuitous routes, drawing the attention of Israeli and Western intelligence agencies. Israel believes these trips, disguised as civilian airline flights, are in fact shipments of Iranian arms and equipment to Hezbollah, including GPS systems that could help convert the group’s stockpile of rockets and missiles into guided munitions. That’s a line that Israel cannot allow the group to cross. Since the 1980s, Hezbollah has been based exclusively in Lebanon and concerned solely with its offensives against Israel. 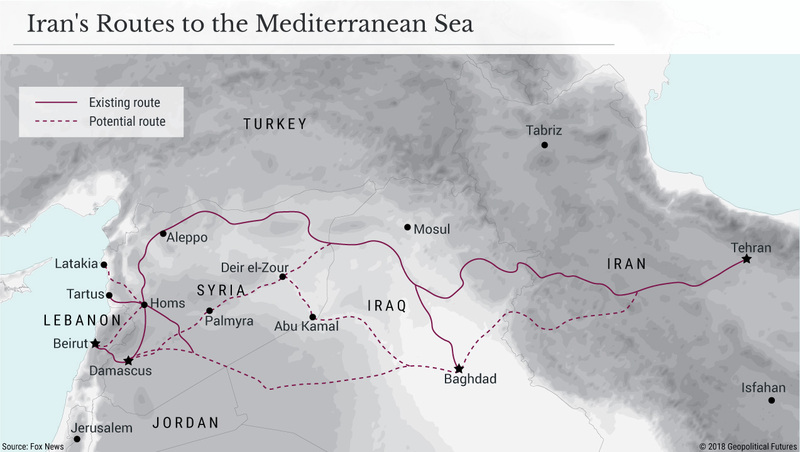 Iran has always backed the group in this endeavor, but for the last few years, Tehran has focused its various offensive forces – including Hezbollah – on supporting President Bashar Assad in the Syrian civil war. 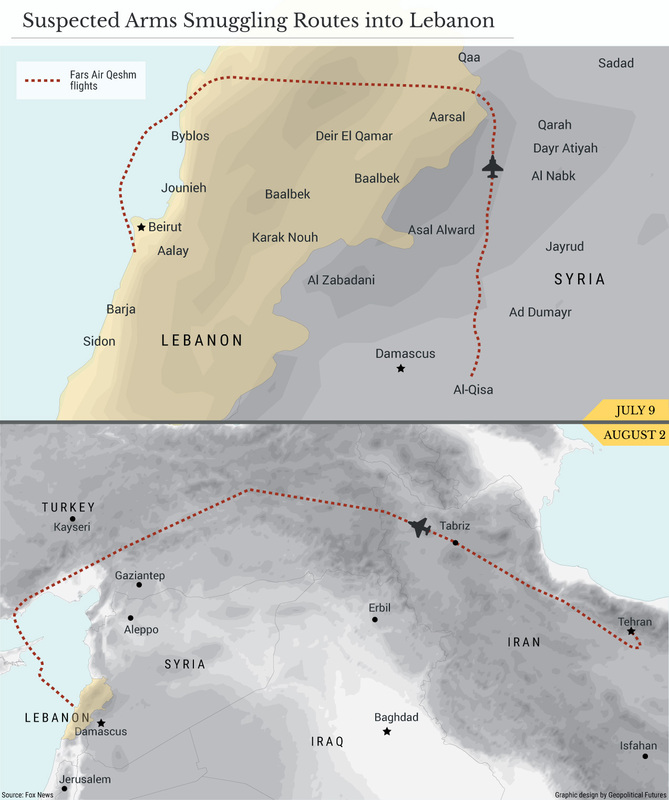 Throughout the fight, Israel has looked on, anxious that an Assad victory would give Iran a coveted overland supply route to Lebanon that would facilitate the transfer of advanced weapons systems to Hezbollah. While Israel has not been shy about conducting airstrikes against arms shipments from Iran to Hezbollah through southern Syria, it picked up the cadence of its strikes earlier this year and took the unusual step of striking Iranian forces directly. (Israel often opts against direct strikes on Iranian forces, preferring instead to hit proxies to minimize the risk of retaliation and escalation.) Those airstrikes created a conundrum for Iran. On the one hand, Tehran has no desire to engage in a direct conflict with Israel, and the distance between them would make waging and supplying such a war extremely difficult. On the other, an attack on its own soldiers required some sort of response. That left Iran with a set of poor options: do nothing and appear unwilling to retaliate against Israel, or attack Israel and risk escalating the conflict – and committing more military and financial resources to it. Iran, perhaps unsurprisingly, chose a middle ground. It launched an anemic retaliation against Israel, firing somewhere between 20 and 50 rockets at the Golan Heights. The move was more a response by obligation – a need to do at least something – than it was an escalation of the conflict with Israel. A response from Iran meant to truly damage Israeli military facilities would have involved hundreds or thousands of rockets – not dozens – and possibly the use of Hezbollah ground forces. Still, Iran needed a longer-term response to Israel. It seems to have chosen to refocus on building up Hezbollah’s arsenal in Lebanon, on helping to build facilities to manufacture precision-guided missiles near Beirut, and on providing guidance systems to upgrade Hezbollah’s supply of unguided projectiles. Iran’s gamble is that Israel won’t be willing to start another ground war in Lebanon, which may be necessary if it is to fully eliminate the threat of Hezbollah’s precision-guided missiles. Here is where the Qeshm flights come into play. Israel can’t tolerate Hezbollah acquiring a potent, precision-guided missile force – such an arsenal would pose too great a threat to its critical infrastructure in the event of a war, causing far more casualties than the 34-day war did in 2006. Yet Hezbollah feels it needs those munitions as a deterrent to large-scale Israeli aggression. It’s a classic security spiral: The security Hezbollah seeks presents enough of a threat to Israel that Israel must act to limit the newfound or nearly acquired military capability, raising the risk of a conflict. 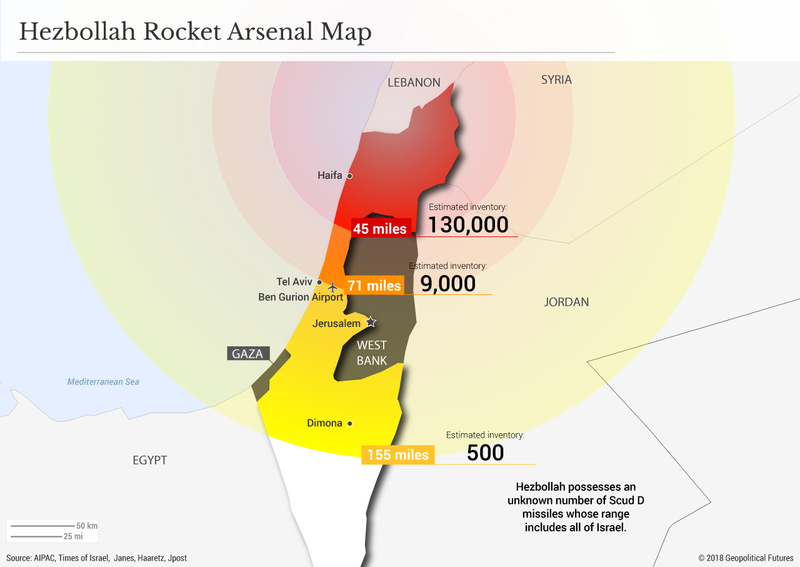 Since the 2006 war, Hezbollah has accumulated a much larger stockpile of rockets; current estimates range between 130,000 and 150,000 rockets, compared with the roughly 15,000 it had before the conflict. Even without precision-guided systems, Hezbollah’s retaliation against an Israeli first strike could be far more damaging this time around. But it’s believed that Hezbollah is already either producing new precision-guided missiles in Lebanon or converting existing rockets and missiles into guided ones. In September, Israeli Prime Minister Benjamin Netanyahu claimed Iran had set up three covert factories near the Beirut airport where Hezbollah, with Iran’s assistance, is producing these missiles. Precision-guided munitions would enable Hezbollah to progress from firing indiscriminately into densely populated parts of Israeli territory to targeting critical infrastructure – increasing the damage to Israel and its population. Hezbollah made this point when it published a video Nov. 30 showing satellite images and coordinates of several Israeli military bases. Of course, the efficacy of Hezbollah’s missile arsenal is only as strong as Israel’s missile defense systems are weak. Systems like Iron Dome would provide some defense against missile attacks. As we’ve written before, though, missile defense systems are not advanced enough to underpin a state’s strategy. They are better used to mitigate damage. Hezbollah now has a large enough arsenal to make Israel question its ability to defend against a coordinated barrage. The growing threat Hezbollah poses is not only in its missile stocks. The Syrian civil war changed the group. Originally designed to fight a single enemy, Israel, on a single front, Hezbollah has now learned to fight in multiple theaters at once. The militia’s strategy once depended on urban warfare tactics, but it has now learned – alongside the Syrian army and possibly Russian special forces – to maneuver in larger units like a conventional military force. And along with missiles, Hezbollah has acquired more tanks, armored personnel carriers and unmanned aerial vehicles – as well as the experience of using them in battle. Fighting rebels in Syria, however, is by no means the same as fighting the Israeli military in southern Lebanon. Israeli forces could easily destroy Hezbollah’s antiquated tanks and artillery. In the event of an Israeli-Lebanese conflict, therefore, it’s likely that Hezbollah would revert to guerrilla warfare, dispersing weapons across a large urban area and firing them from dense civilian populations centers. (If Israel responded, Hezbollah would benefit from the media coverage of civilian collateral damage.) Israel’s ability to eliminate Hezbollah’s precision stockpile without a ground force, a costly choice it would prefer to avoid, would be uncertain in that scenario. This isn’t a new problem for Israel. Its overdependence on air power in 2006 led to an outcome in which not only was Hezbollah not destroyed, but it also managed to rebuild quickly and retain popular support. And though Israel’s military is technologically superior to Hezbollah, urban warfare could blunt that advantage. Israel will likely try to focus on destroying the precision-guided missile stockpiles and factories, relying on air power to do so. At the same time, Hezbollah has combat fatigue from its years in Syria. The war has taken a toll on its fighters and has forced the group to take on undertrained and ideologically lukewarm recruits to maintain its ranks. This makes missiles even more valuable to Hezbollah; it can inflict more damage on Israel without relying on extensive manpower, a point of potential weakness – especially relative to the Israel Defense Forces. But Hezbollah’s efforts to deter Israel may in fact invite a pre-emptive strike against its weapons. The end of the Syrian civil war, then, by no means implies newfound stability in the Middle East. As Assad has consolidated his grip on power in Syria, Israel has watched Iran creep ever closer to its borders and arm the proxy that represents its most serious threat. That Hezbollah feels it needs weapons that Israel considers to be beyond a red line makes conflict between the two more likely. Investment bosses at fund managers controlling $21tn of assets warn that high levels of corporate debt and tighter liquidity pose a risk to the global economy in 2019. The executives predict that volatility will be an overriding feature of markets next year, while this year’s dominant events — Brexit, US-China trade tension and hardening monetary policy — will still influence their decisions. Investors should strap in for a “wild and bumpy ride”, said Kristina Hooper, chief global market strategist at Invesco, the $1tn US manager. She identified the three biggest risks for 2019 as protectionism, monetary policy shifts and high levels of debt. “Any one of these is significant. Together they represent a perfect storm, with the potential to negatively affect economic growth and roil markets,” she said. Other investment bosses who singled out corporate debt as a significant risk included Pascal Blanqué, chief investment officer at Amundi, the $1.7tn French manager; Anton Eser, CIO at Legal & General Investment Management, the $1.3tn UK business; and Andrew Balls, global CIO for global fixed income at Pimco, the $1.7tn US bond specialist. Mr Balls added that Pimco would be paying close attention to debt markets and liquidity should investors move out of fixed income. “It makes sense for us to be very cautious in terms of our overall corporate credit exposure, and see non-agency mortgages as offering a defensive alternative,” he said. A trade war between China and the US has preoccupied market analysts this year, and several investment chiefs believe it will be a dominant global risk in 2019. Stefan Kreuzkamp, CIO of DWS, the $780bn German fund manager, said trade tension edged out Brexit and Italy’s budget negotiations with the EU as the biggest risk for investors. However, Akiyoshi Nagashima, CIO of Sumitomo Mitsui Trust Asset Management, the $570bn Japanese investment company, was optimistic following recent talks between US president Donald Trump and Chinese president Xi Jinping. Most investment heads contacted by FTfm said they were warning clients to prepare for volatility. Yet Suni Harford, head of investments at UBS Asset Management, the $800bn Swiss group, said there was a possible upside to giddy markets. “Higher volatility means plenty of opportunity for skilled stock pickers,” she said. - WTI falls below $50/bbl as the oil bull thesis is attacked from all sides. - We explain that these two variables cannot co-exist, U.S. oil production growth of 2 mb/d and sub $50 WTI. - But the crazy thing is even if you assume a stellar U.S. growth figure, the world will still be in undersupply in 2019/2020. - In the short-term, we can look stupidly wrong on our thesis, but fundamentals will matter. We stand by our numbers. Welcome to the attack from all sides edition of the Oil Market Daily! Since our ill-fated oil article titled, "Brent Breaks $80: The Oil Bull Thesis Enters The 7th Inning," oil bulls went from the White House to the s*** house. The oil bull thesis went from oil demand destruction is the only valid bear thesis to 1) will President Trump keep a lid on prices? Will trade war cause further demand destruction? Will U.S. shale oversupply the world? Will Iranian sanction waivers result in no decline in Iranian crude exports? Will OPEC cut of 1.2 mb/d be enough? The reality is that despite the craziness of U.S. oil production growth this year, U.S. shale is still at the whims of the volatility of the oil market. Since cost breakevens were already cut to a minimum in the last downturn, there won't be any new innovative cost reduction methods this time around. And since servicing cost inflation is already near cycle lows, there won't be any cost cut incentives from suppliers. In addition, U.S. shale producers came into 2019 ill-equipped on hedges for next year making capex budgets extra vulnerable to price weakness. What does this lead to? It leads to U.S. shale potentially disappointing growth on the downside. But here's what's more ridiculous and this is the point we tried to get across in our article, "U.S. Oil Production Likely To Grow 2 Mb/D In 2019 But Crude Quality Issue Will Get Worse." Even if you pencil in +2 mb/d from U.S. total liquids growth, we still have a supply deficit in 2019. And keep in mind we are using global oil demand growth of ~1.38 mb/d for 2019 and we have global oil demand growth falling y-o-y in Q1 2019 by 1 mb/d. What this ends up being is a market that will be in serious supply issues by the second half of 2019. Now of course, OPEC can surprise to the upside with higher production levels, but low oil prices result in more geopolitical chaos. Libya just announced force majure on its largest field resulting in ~400k b/d of loss supplies. But the oil market took that in strides and pushed prices lower by another 5%. At the end of the day, what we are saying is that yes prices can keep falling for whatever reason that currently grips the market today. 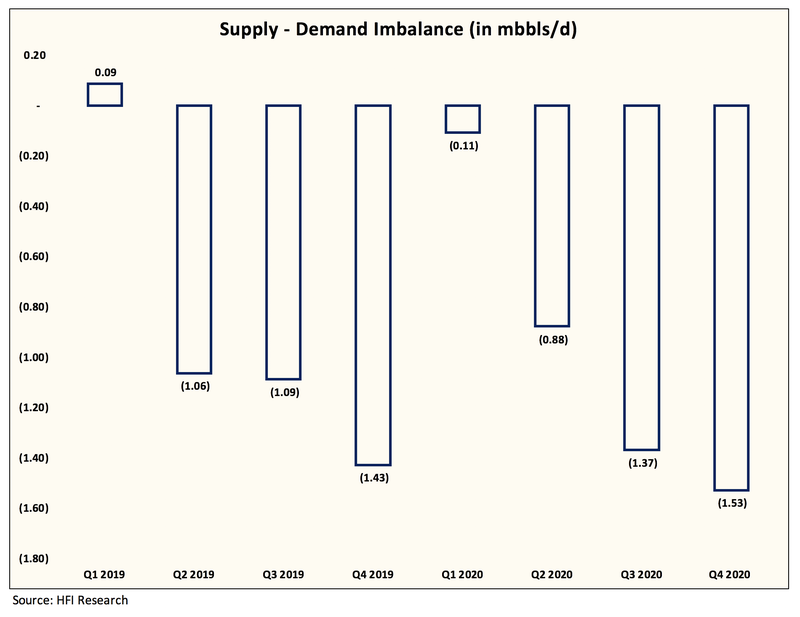 But it will eventually have to revert back to fundamentals and the global oil supply/demand outlook for 2019/2020 is that of a market in severe deficit. 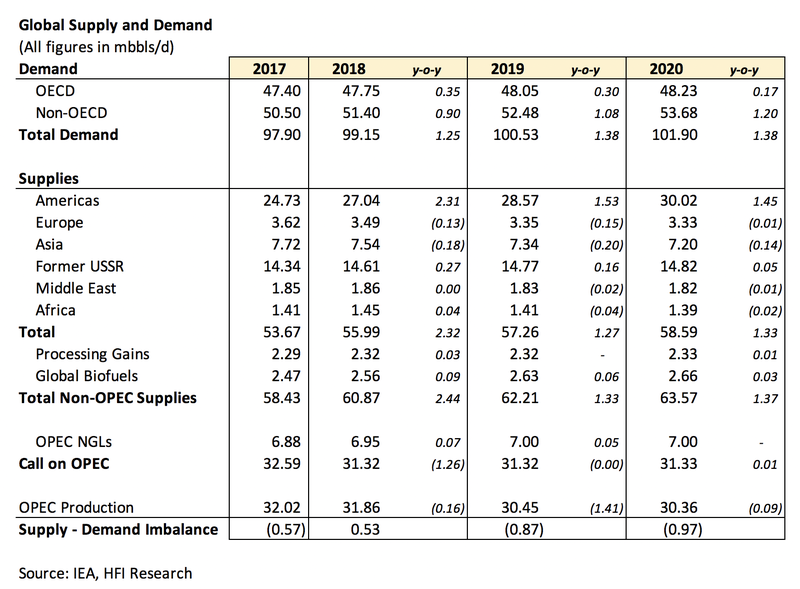 With the world ever increasingly reliant on U.S. shale to deliver, just a stalled growth outlook for a mere 6-months will cascade into a deeper deficit down the road. This is why U.S. shale will never be a swing producer because prices can impact its growth. So yes, we got the Q4 outlook incredibly, massively, disgustingly wrong, but the fundamental outlook has not changed. And while the oil bull thesis is attacked from all sides, we are standing our ground behind our numbers.